Tons of Tomatoes? Make Marinara! Preheat your grill on medium heat. Cut the tomatoes in half and remove the stems. 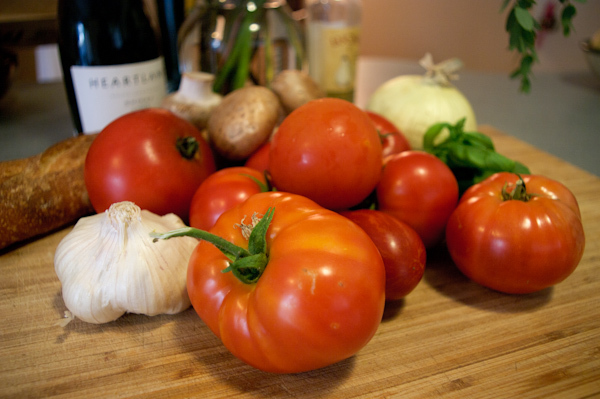 Using 2 tablespoons olive oil, brush the cut side of each tomato. Place the tomatoes cut side down on the grill and cook for 5 to 10 minutes. The skin will start to wrinkle and turn brown at the ends and should be easy to take off. Remove the tomatoes from the grill and remove the skins. Meanwhile, in a large pot heat the olive oil on medium. Add the onions and saute until they start to caramelize. Add the garlic, mushrooms, spinach, and oregano and cook for 5 minutes. Deglaze the pan with the red wine. Add the tomatoes and their juice, sugar*, and 1 tablespoon fresh basil. Bring to a simmer and cook on low, stirring occasionally for about 1 hour. Add remaining 1 tablespoon of basil just before serving. Add salt and pepper to taste. * Note that a few of our tomatoes were slightly under-ripe. If you are using fresh, fully ripe tomatoes, you may not need to use the sugar.